Callistemon are a group of evergreen medium to large shrub with bunches of ‘bottle brush’ flowers in Spring and Summer. The cylindrical flowers of Callistemon give them the common name. Offered by wholesalers in sizes from tubestock to large potted specimens, use them for mass planting or for feature specimen trees. Callistemon are generally a hardy plant that tolerate drought and frost. Callistemon make great garden and landscaping plants, they attract birds and can be prunned lightly to retain shape or cut back heavily if required. Full sun and a low phosphorous fertiliser, mulch to retain moisture. Some callistemon can be used as hedges or screens ‘Captain Cook’ is one example. 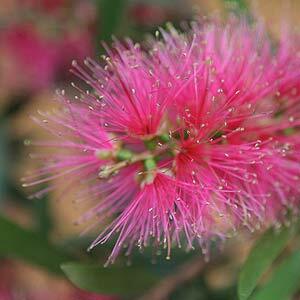 Callistemon are available for sale from the following wholesale nurseries.